Today, thanks to a post by Fairy Dust Teaching, I discovered a new-t0-me blog that is causing me to re-think what a sensory table activity could look like! The blog is by Teacher Tom Bedard (not to be confused with the Teacher Tom blog, which is another fabulous resource!) Tom Bedard has taught early childhood classes for over 30 years. His blog is all about Sand and Water Tables. I’m going to share here just a few photos from his blog that made me think in new ways about sensory tables. 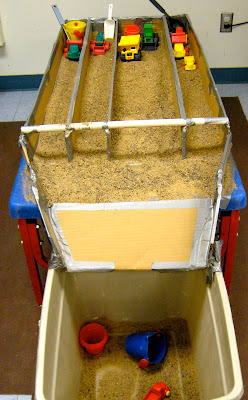 I really encourage you to go directly to his blog at: http://tomsensori.blogspot.com/ to see LOTS more pictures and delightful videos showing lots more great ideas, and also thoughtful posts on his experiences with how children use these materials in the classroom. Tom builds “apparatuses” from cardboard boxes and other materials that he mounts over sensory tables. Like this one with two inclined planes that kids can slide materials down and into the plastic tubs below. Or this apparatus with inclined tubes, with lots of inlets and outlets. Or this item, which I don’t think I’d use at the sensory table, but would be very fun for toddlers to drop pompoms, juice can lids or clothespins in. 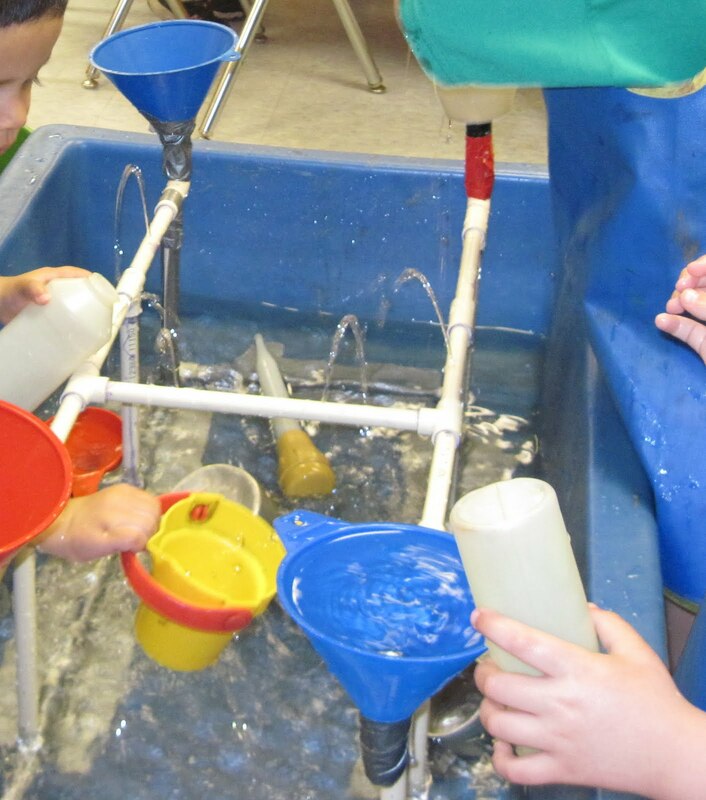 All these ideas take the sensory table and water table to completely different levels than I have seen before. I’m still wrapping my mind around all the possibilities. 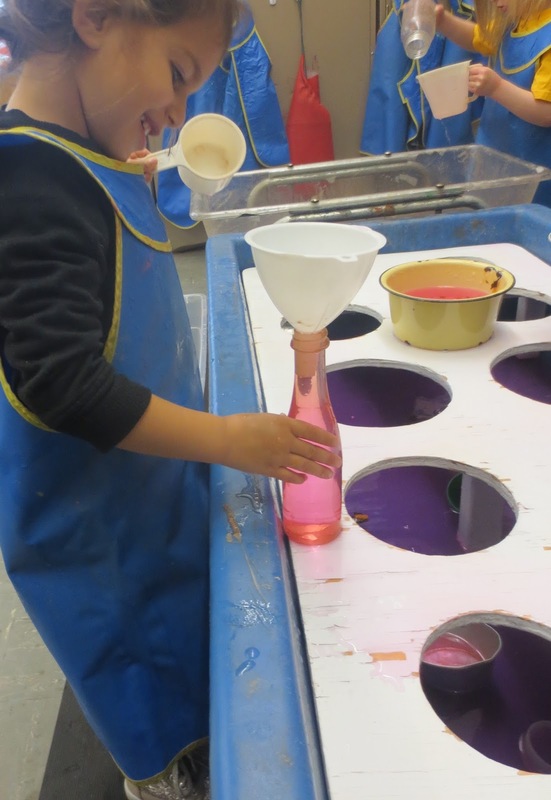 And, I worry about the challenges we all worry about with sensory play – will the mess be manageable? Can I build things the kids LOVE that don’t look junky to the parents? How much time would they take to build and would I want to store them to re-use and where would I store them? So, I’m thinking about all that, but I’m also thinking about the things Tom shares on his site about what kids learned through playing with these items, and thinking about the videos on his site with happy, giggling children exploring these ideas. This will all bubble around in the back of my mind for a while as I decide how to incorporate these new ideas into my toddler classes or my preschool/elementary STEM classes.